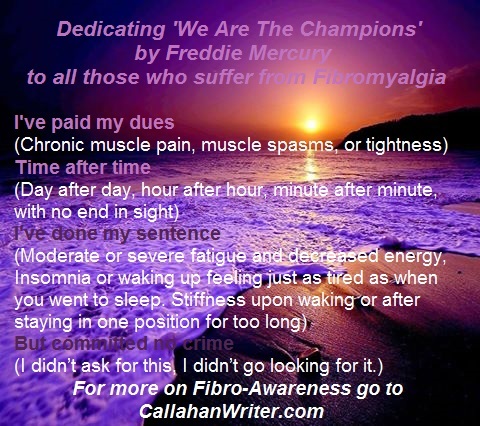 A Song Dedication To Fibro Awareness – We Are The Champions | Troy C. Wagstaff aka CallahanWriter Blog: Topics of interest include Western Historical (1865-1899) Topics. Additionally inspirational Christian and Fibromyalgia interests. Chronic muscle pain, muscle spasms, or tightness. Moderate or severe fatigue and decreased energy. Insomnia or waking up feeling just as tired as when you went to sleep. Stiffness upon waking or after staying in one position for too long. 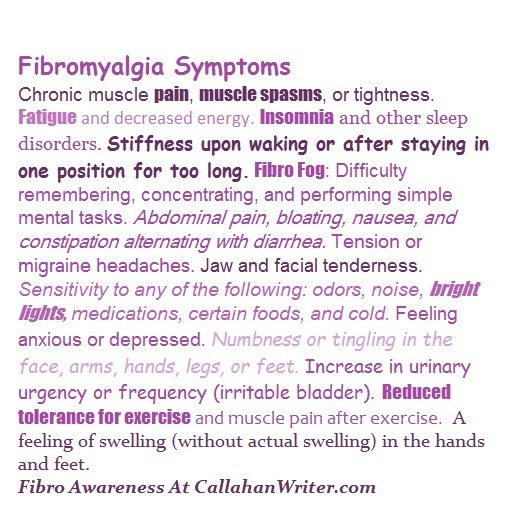 Difficulty remembering, concentrating, and performing simple mental tasks (“fibro fog”). Abdominal pain, bloating, nausea, and constipation alternating with diarrhea (irritable bowel syndrome). Sensitivity to one or more of the following: odors, noise, bright lights, medications, certain foods, and cold. Numbness or tingling in the face, arms, hands, legs, or feet. Increase in urinary urgency or frequency (irritable bladder). Reduced tolerance for exercise and muscle pain after exercise.